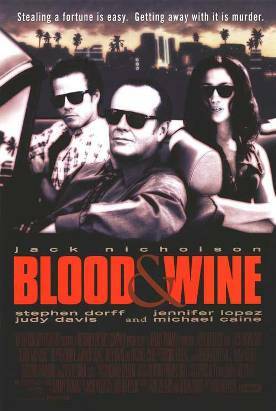 Blood and Wine is another of those collaborations between Bob Rafelson (director) and Jack Nicholson (star) which promises to be on the cutting edge of hip—just as Five Easy Pieces, The King of Marvin Gardens and The Postman Always Rings Twice were in their day. Another way of putting it might be that the film is, as Pauline Kael said of Chinatown (a Nicholson-Polanski collaboration), “a celebration of rot.” For that is what, I take it, hip means: a vaguely noirish cynicism that actually likes the corruption that is its milieu. But this is a dangerous attitude—destructive, if it is allowed to get out of hand, of dramatic tension and other things that make movies watchable. In the old noir thrillers, that is, the corruption was not general. One always had the sense not only that there was a basic decency in the world outside that of the gangsters and hustlers with whom we were being invited to slum it, but that even the more sympathetic characters in the noir milieu had, like Philip Marlow, a code of honor that meant something to them. It is these qualifiers of the corruption that seem to have gone out of movies in the last twenty years or so. As I wrote of Robert Altman’s Kansas City last year, too much hip without any innocence quickly degenerates into a mere succession of attitudes or poses, and that is what more and more movies are becoming these days. It is the MTV temptation: why bother to tell a story or carefully build up a character—the hard work of artistic creation in dramatic form—when all people seem to want is those hip attitudes that can be reduced to a series of images on a five minute music video. This is not exactly the problem with Blood and Wine. On the contrary, I found myself full of admiration for the plotting, the basic story-telling involved. The characters promise to be interesting, though in the end they suffer from the general flattening that one finds in hip movies. Or maybe it’s just Jack Nicholson movies. In everything he’s done since Chinatown (that I can think of) he has worked so hard at being hip and opaque that he has brought down everybody around him, sucked them into that noir hole of hipness that he seems to think is what artistry means. This is no exception. Nicholson’s Alex, a wine merchant in Miami whose taste for the good life has him constantly on the edge of bankruptcy, decides to go into business as a jewel thief but reckons without the fatal complications in his personal life, which get in the way of his dream of affluence. Here there are potentially strong characters, especially Alex’s accomplice, the aging, tubercular safe-cracker, Victor, played by Michael Caine, and his deeply unhappy, alcoholic wife, Suzanne, played by Judy Davis, but even two such splendid actors as these cannot entirely resist being drawn into the Nicholson orbit, and the young characters, Stephen Dorff as Jason, Suzanne’s son from a previous marriage and Jennifer Lopez as Gabriela, the beautiful Cuban nanny who is Nicholson’s mistress but has a strong attraction to Jason, can scarcely be said to exist apart from their relationship with the attitude-laden Alex. His attitudes produce theirs. Gabriela loves his promises of security and hates his using her while Jason simply hates him. Not that we don’t know how he feels. What, you may ask, is the Israeli government doing here? Well, nothing. It is a writerly addition and not something a man like this would ever have said. A few minutes later they are arguing about whether it was Reagan or Bush who used the expression “a thousand points of light” which, with a typical witticism, Alex has applied to the sparklers they have just pilfered from the rich guy’s cheap home safe. When someone dies, Victor says he approves of “civilized” cremation over burial, “ashes straight to ashes and no worms.” Then he adds, “I worry enough about worms as it is.” Except he doesn’t. These are just examples of a writer trying to write funny. In the right mouth, in the right context they might have been funny too, but here they are not. “You’re not that stupid,” says Alex. “Yes I am,” says Gabriela. But in fact, no she’s not. That much we can tell from the genre, which does not promise us sudden conversions at the end. Yet somehow, the ending still seems too pat, too easy—not only because everybody but the bad guys gets a consolation prize but because everything else in the movie suggests the writers’ and directors’ thinking, rather than that of the characters.